Italian golfer Francesco Molinari watches his drive from the 8th hole during the first round of thePGA Championship at Wentworth Golf Club in Surrey, on May 23, 2013. Molinari has charged up the leaderboard in the second round of the European PGA Championship on Friday. Italy’s Francesco Molinari charged up the leaderboard in the second round of the European PGA Championship on Friday. The Ryder Cup star had a run of three birdies in four holes from the 11th to go to six-under par the same mark as overnight leader James Kingston who was amongst the later starters. Molinari started the day at two-under par and although he dropped a shot at the first he had back-to-back birdies on the third and fourth to repair the damage. After another dropped shot on the tenth he turned on the style and was joined at six-under by South Africa’s George Coetzee although a bogey at the 17th saw the latter drop back and he signed for a two-under par 70. However a bogey at the 16th saw Molinari fall a shot behind Kingston with two holes to play. 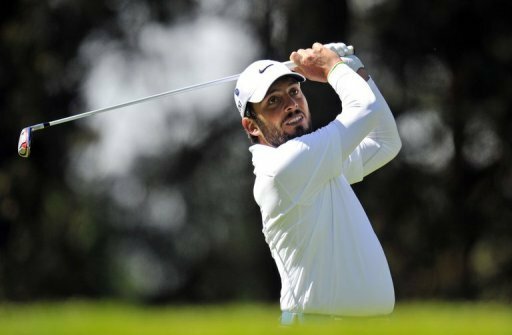 Simon Khan, the winner here in 2010, was another player going well kick starting his day with an eagle at the par-5 fourth and a birdie two at the tenth to move to five under. Khan was joined in second spot by Scoland’s Marc Warren, Spain’s Alejandro Canizares and Mikko Illonen of Finland who opened up with two pars after Thursday’s 67. But some big names were struggling to make the cut with Ian Poulter at six-over par through 16 holes and Luke Donald on the same score with two to play – a hangover from his first day 78 and the defending champion is unlikely to feature at the weekend. Sergio Garcia – the centre of a racism storm here this week and playing with Donald – was level par for the tournament whilst a group further back Lee Westwood was playing solidly on two-under. England’s Andy Sullivan had the second hole in one of the week when his tee shot on the second found the cup. Sullivan, playing on a sponsor’s invitation, followed Jason Livermore whose 8-iron went straight in on the same hole on Thursday. Sullivan’s was his first ace in the European Tour and the 26th in the history of the championship. Rory McIlroy, Justin Rose, Graeme McDowell and Martin Kaymer were amongst the later starters with McIlory attempting to make a move after a disappointing 74 on the first day.